Webinar: April 7, 12:00 noon – Inherited IRAs – The Clark Decision – Landmark U.S. Supreme Court Case Holds Inherited IRAs are Not Protected from Creditors | The Levin Law Firm - Philip Levin, Esq. 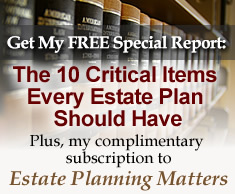 As detailed in our September 2014 edition of Estate Planning Matters [click here to read], the U.S. Supreme Court decided, in a landmark 9 – 0 unanimous decision, that inherited IRAs are not protected from the claims of current and future creditors of a beneficiary. The decision in Clark is another significant reason why designating a qualified trust as beneficiary of an IRA is an important planning strategy for clients who desire both asset protection and income tax-deferral benefits for beneficiaries of their retirement plan accounts. On Tuesday, April 7th at noon, the Society of Financial Service Professionals (SFSP) will host a webinar detailing the Clark Decision, its impact for your clients, and planning strategies that are prudent and effective. I believe this program will be of value to you. It is free to SFSP members, and for non-members the cost is $19.95. If you are interested in attending this webinar, please see the attached invitation link and instructions for registering on-line, or call the SFSP to join the program at (800) 392-6900. This Clark Decision greatly strengthens our long-standing position that an IRA Beneficiary Trust is an excellent wealth transfer planning strategy in order to protect tax-deferred retirement plan assets which transition to the next generation. Of course, these Trusts need to be adroitly drafted, by competent legal counsel, and include the proper discretionary distribution standards. If you are interested in discussing trust and estate planning strategies, which may be of value to you and your clients, please contact Lauren at The Levin Law Firm to arrange a complimentary consultation.